The one with the sharp two-edged sword says this : 'I know that you live where Satan's throne is, and yet you hold fast to my name and have not denied your faith in me, not even in the days of Antipas, my faithful witness, who was martyred among you, where Satan lives. yet I have a few things against you. you have some people there who hold to the teaching of Balaam, who instructed Balak to put a stumbling block before the Israelites: to eat food sacrificed to idols and to play the harlot. Likewise, you also have some people who hold to the teaching of (the) Nicolaitans. Therefore, repent. Otherwise, I will come to you quickly and wage war against them with the sword of my mouth. Whoever has ears ought to hear what the Spirit says to the churches. To the victor I will some of the hidden manna; I shall also give a white amulet upon which is inscribed a new name, which no one knows except the one who received it." 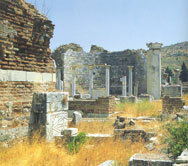 The church in Pergamum (2:12-17) existed in the place where Satan had his throne. This reference probably does not refer to the altar of Zeus that sat atop the thousand-foot acropolis that towers over the lower city. Rather it refers to the city as the seat of the provincial koinon, or assembly, whose leader was also the chief priest ("the beast out of the earth"; 13:11-17) of the imperial cult-the first cult temple in Anatolia. The Roman governor of Asia exercised the power of life and death-the "right of the sword" (ius gladii)-in his province. Jesus stated he held even higher authority with his sharp, double-edged sword. One church leader named Antipas had already been martyred in the city. He was the only person named in Book of Revelation as a martyr. The imperial cult temple housed a white stone stele inscribed with a decree issued by Fabius, the governor of Asia, around 9 B.C. It decreed that Augustus' birthday should be made an official holiday in Asia as well as mark the beginning of the municipal new year.